Providing all the great features of the Revolver X2, the Revolver X4 now has an upgraded, premium vinyl overlay with a matte black finish. Operating like a roll-up tonneau cover, the Revolver X4 takes it step further and works without Velcro or snaps. The end result is a flush fit, no-hassle design. BAK's patented Rotational Locking Rails feature exclusive side rails that automatically engage the aluminum slats of the cover when the cover is fully closed. 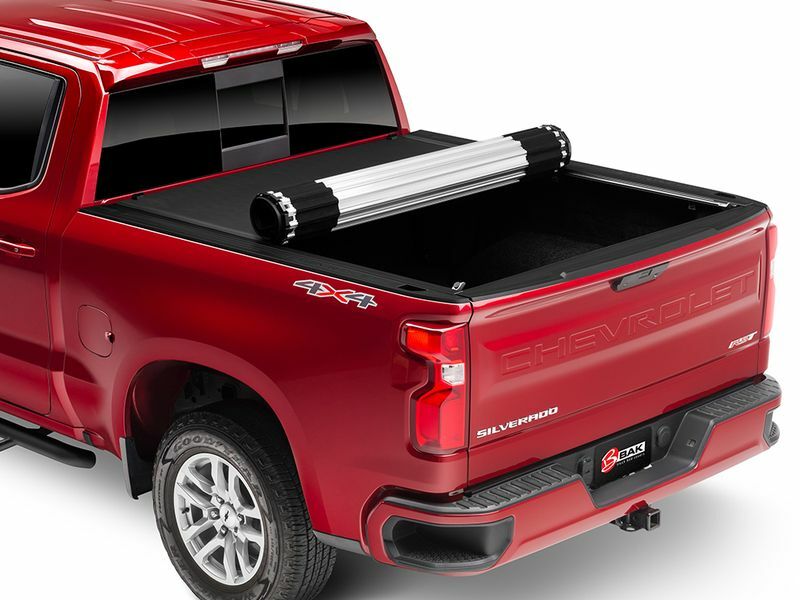 Locking the tailgate provides the ultimate security for the truck bed. Simply roll the cover to the front of the bed to make full use of the truck bed. The cover can be driven in the open position by securing it with both buckle straps. The rear view mirror can still be used while the cover is open. One-hand operation is attainable with the pull cable release. This can be used from either side of the bed to open the cover. The automatic slam latches will secure the cover at the rear when closed. The Revolver X4 uses weather resistant seals along the sides of the cover to create a strong seal to the bed of the truck. The vinyl overlay creates a one-piece design so water and debris can't make its way through the aluminum slats. Receive offers, coupons and be the first to know about new arrivals. © 2019 BAKFlip. All rights reserved.